Here's the good news: landing pages don't have to be complicated to be effective. If you are actively engaged with inbound marketing, or considering this as a strategy, landing pages are an essential building block in the strategy structure. Think of it this way: if you succeed in drawing a visitor to your website through the content you've put out there, or from your great search engine optimization, what do they do when they get there? "A landing page is a web page that allows you to capture a visitor's information through a lead-capture form (AKA a conversion form)." Without a landing page your visitors will typically go right to your home page, which is only "okay", or your blog, which is better. But the statistical odds of getting those visitors to contact you after showing up on your website are slim to none. So they come and they go and you never get a chance to reach out to them again. A targeted landing page, on the other hand, lets you focus on your ideal audience and offer them something of value to them. 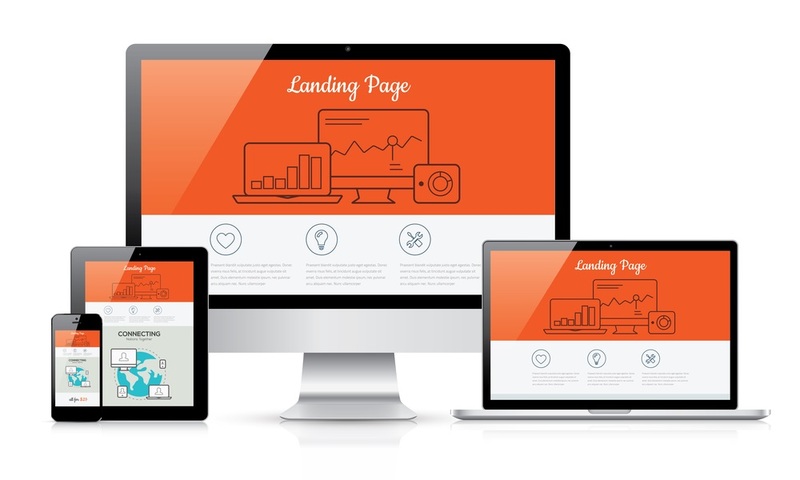 A landing page allows you to convert a higher percentage of your visitors into leads. And you also capture their contact information along along with who they are and how they found you. "Online marketers have used the term “landing page” for many years to describe a sales tactic focused on getting people to take one, specific action. Today, landing pages have simply become a required element in the marketing toolbox for every imaginable business, including local brick and mortar types. A landing page is just the page people land on because an ad or email directed them to that specific page as opposed to your site’s homepage." Here's a dirty little marketing secret: landing page design and construction can be complicated and complex. And this is often the case for large businesses with deep pockets and dedicated marketing agencies running their campaigns. But here's a happy little secret - they definitely don't have to be. If you have really deep pockets and a high-octane marketing agency handling all of your marketing activity for your brand, you probably wouldn't be reading this, for one thing, and you probably have no idea what they are doing for you anyway. So, let's look at the basics for a simple yet, effective landing page. First, to make it really easy, there are numerous apps, software and online providers for creating and setting up landing pages, Heck, you can even have us do it for you! But, for a simple, yet effective landing page, using an app to set it up is a breeze. The real juice that powers a good landing page is the design and the copy, or words, you choose to use. There are some basic essentials that any good landing page should have. We will take a brief, high-level look at these essentials and wrap up with some thoughts on how to best use your landing pages. 1) No Navigation - Only ask for what you need and remove all other navigation. In other words, there should be no links on a landing page except for the important one - the call-to-action button. One way to think of it is that a landing page is a like a room with only one door to go through. "For every 10 people that visit your landing page, at least seven of them will bounce off the page. To keep that number low, your visitors need to know (and understand) what’s in it for them within seconds of arriving." 3) Value Statements - This is essentially a brief description of your offer that clearly emphasizes its value. Write compelling copy that guides your visitor to the desired action. This is where knowing your audience is critical. Speak their language and speak directly to them in your brand's natural voice. 4) Relevant Image - At least one supporting image. In fact, too many images can be distracting. Some good landing pages use one image as the background for the entire page. What is most important, however, is to choose an image that illustrates your offer. In other words, if you're not giving away cats, no cat pictures! 5) Lead Capture Form - This is the form you use to capture a visitors' information. When you layout the page be sure to place your lead form above the fold. This simply means that it should be visible and accessible to a visitor without having to scroll the page. AND... remember to add a clear and compelling call-to-action and a relevant offer to give away when they click and submit. Okay, so that's a bit trite these days and overused. But the truth of landing pages is that they generate real conversions. A website without landing pages languish for the most part without any significant number of visitors actually contacting them. And the possibilities for improving and expanding on your landing page strategy are almost endless. For example, adding video to a landing page is like adding rocket boosters to your conversion rate for that page. This means that, while landing pages are a far more effective means of converting visitors into leads, nearly half of B2B companies still aren't using them. And this is good news for you. One source found that the best landing pages see conversion rates of up to 27.4 percent. However, the median ranges across various industries are lower, with most seeing between a 2 and 6 percent conversion rate. While this is great news. the first step is to start with a landing page or two and get comfortable with the process and the strategy. If you are considering getting help with your company's marketing efforts, it is helpful to have the insights of a third-party, a marketing professional, to assess and assist with your strategy. BroadVision Marketing offers helpful information on how to use LinkedIn. You can get free advice during your Free Complimentary Inbound Marketing Session which will help you learn more about LinkedIn and its place in Inbound Marketing.